Dalfo, C.; Fiol, M.; Miller, M.; Ryan, J. In this note we present a general approach to construct large digraphs from small ones. These are called expanded digraphs, and, as particular cases, we show the close relationship between lifted digraphs of voltage digraphs and line digraphs, which are two known ways to obtain dense digraphs. In the same context, we show the equivalence between the vertex-splitting and partial line digraph techniques. Then, we give a sufficient condition for a lifted digraph of a base line digraph to be again a line digraph. Some of the results are illustrated with two well-known families of digraphs, namely, the De Bruijn and Kautz digraphs, where it is shown that both families can be seen as lifts of smaller De Bruijn digraphs with appropriate voltage assignments. We study the relationship between two key concepts in the theory of digraphs, those of quotient digraphs and voltage digraphs. These techniques contract or expand a given digraph in order to study its characteristics,or to obtain more involved structures. As an application, we relate the spectrum of a digraph Γ, called a voltage digraph or base, with the spectrum of its lifted digraph Γα. We prove that all the eigenvalues of Γ (including multiplicities) are, in addition, eigenvalues of Γα. This study is carried out by introducing several reduced matrix representations of Γα. As an example of our techniques, we study some basic properties of the Alegre digraph and its base. Dalfo, C., Fiol, M., Miller, M., Ryan, J. 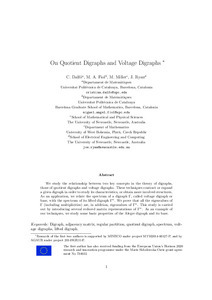 On quotient digraphs and voltage digraphs. "The australasian journal of combinatorics", Octubre 2017, vol. 69, núm. 3, p. 368-374.